We encourage customers to contact us for assistance and support. Our goal is to provide a high level of customer service, with a four-hour response time to support requests whenever possible. An incident is a single reproducible issue that focuses on one aspect of the Jamf software and can be identified by isolating specific symptoms. A reproducible issue is any problem that can be re-created on Jamf’s systems. If an incident can be broken down into subordinate issues, each issue will be handled as a separate incident. 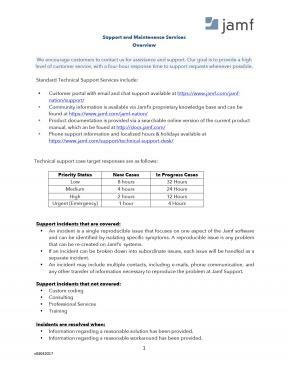 An incident may include multiple contacts, including e-mails, phone communication, and any other transfer of information necessary to reproduce the problem at Jamf Support. Information regarding a reasonable solution has been provided. Information regarding a reasonable workaround has been provided. Information that the issue is resolved by upgrading to a newer release of the product in question. Information has been provided that isolates the issue to a third-party product. Disclaimer: This overview is to be used for general guidance only. Each organization’s End User License and Services Agreement or other written agreement with Jamf will govern the full scope of the licensed software offering including Support and Maintenance Services.